Sky Q service goes on sale | What Hi-Fi? Sky's next-gen TV service, Sky Q, is now available to buy, with prices for the Q boxes ranging from £99 to £299. New and existing Sky customers can buy Sky Q online or over the phone from today, with the first installations due to take place by the end of the month. Sky’s 250 retail outlets will begin taking orders from Friday 12th February, should you prefer the bricks and mortar experience. Sky broadband customers will be first in line, with customers who take Internet from other providers having to wait their turn. Following the Sky Q launch in November, we got some time with the new service last month - you can read our Sky Q hands-on review for a more in-depth look at the service. One thing's for sure - it's a premium service, with the entry-level Sky Q bundle priced at £42 per month for new customers and the Sky Q Silver bundle at £54 per month. If you want to add Sky Movies and Sky Sports to that bundle it will be an extra £34.50 per month - for a top price Sky Q bundle of £88.50 per month. The current top price Sky TV bundle is £75.75. There's a charge for the new box too - and it's noticeably cheaper for Sky broadband customers. If you don't have Sky broadband, Sky Movies or Sky Sports, the Q box will be £249 and the Q Silver box will be £299. A Sky Q Silver bundle with the Sky Q Silver box and one Mini box will also be available for £299. If you do have Sky broadband, Sky Movies or Sky Sports, the Q box will be £99 and the Q Silver box will be £149. The same Sky Q Silver bundle with the Sky Q Silver box and one Mini box will available for £99. Existing customers who already pay for HD or multi-room will also be able to get the Q Silver bundle at the discounted price of £99. There is also a £50 installation charge for existing customers - the dish needs a part upgraded - and it's worth noting Sky Q subscriptions are 18-month contracts as standard. So is Sky Q more expensive than existing Sky+HD? Well, yes, but then it was always clear it would be. For premium subscribers it may not be much more, however, with the top HD package with Sky Movies and Sky Sports around £10 more expensive on a monthly basis (don't forget the set-up charges, however). Of course there's no mention of whether 4K content will cost yet more as and when it arrives. Much will depend on your existing subscriptions - if you already pay for multi-room and all the channels in HD, it may not be a huge step-up. For customers who pay much less a month, joining Sky Q will look expensive. Similarly, there's clearly a real incentive to be on Sky broadband if you want Sky Q first and at a more affordable price. Non-Sky broadband customers may find themselves paying a lot more upfront. One thing that some might think is 'missing', is 4K content. Sky Q won't have 4K at launch but Sky has said it will bring "the UK’s most comprehensive Ultra HD service" to Sky Q later in the year. Earlier this year Sky posted its latest set of finanical results, which showed operating profits up 12 per cent year-on-year for the six months to 31st December, as 337,000 new customers joined Sky - the highest number for 10 years. 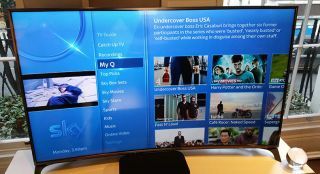 Sky also revealed there would be a "more advanced" Now TV box released later this year. Existing Now TV customers will also see a new interface roll out to their TVs this month, combining the free and pay-per-view Now TV content and with an emphasis on editorial recommendations.